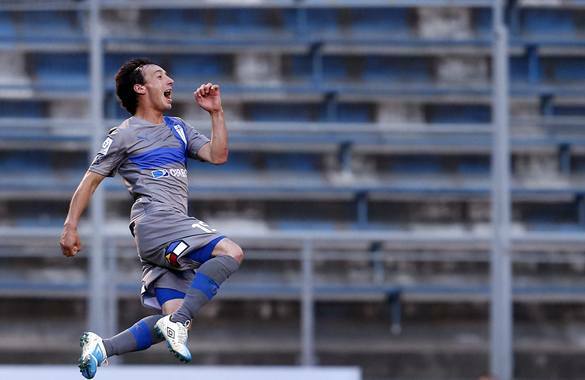 Universidad Católica reached the semi-final stage of the Copa Sudamericana for the first time in seven years with a thoroughly deserved two-legged victory over the ‘King of Cups’ Independiente; a result that may just trigger a steep upturn in the fortunes of Los Cruzados. Only two weeks ago Martín Lasarte was receiving criticism from his own fans as UC hang perilously close to dropping out of the play-off spots in the Clausura. However salvation has come in the Sudamericana, and with each positive result in the competition the more they are looking a settled and confident outfit. What is it with this Universidad de Chile side? 25 games unbeaten, a Chilean record broken for consecutive minutes without conceding in international competition, a 4-0 destruction of Flamengo in Brazil and on Sunday in the Superclásico rescuing a draw in the 101st minute despite playing the whole of the second half with not eleven, not ten but nine men. And I haven’t mentioned the talent in the team or the vibrancy in the side’s play. Now – thanks to a hard-fought performance – the club’s first ever competitive win on Argentine soil. 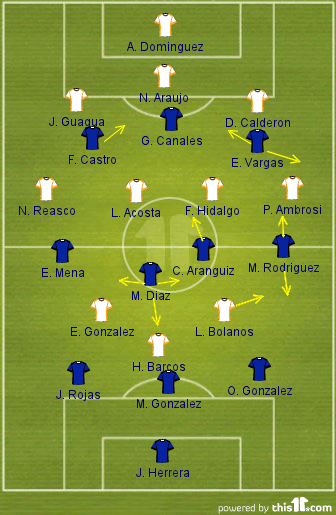 Arsenal are the antithesis of their English namesake; set up in a 4-4-1-1 shape they favour a direct approach, two traditional wingers in Diego Torres and Juan Pablo Caffa supporting a front two of Emilio Zelaya and the target-man and focal point of the Arsenal attack Mauro Obolo, charged with holding the ball up. The midfield base of Jorge Ortíz and Iván Marcone play a simple game, if one goes forward to support the other stays to protect the defence; essential with the forward runs of both full-backs. By now we all know how Universidad de Chile like to play; a fast possession based game, suiting their diminutive personnel while putting pressure on the opposition when out of possession. 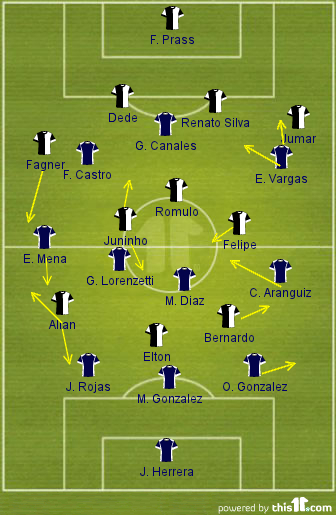 The starting line-up was identical to the one which started away to Flamengo. 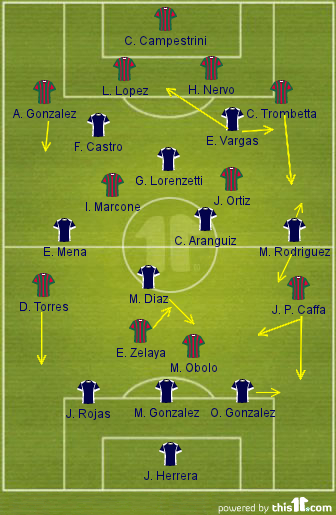 However Matías Rodríguez was pushed into a more advanced role down the left, making a 3-1-3-1-2 almost as you can see from the formation diagram. The performance was unlike the one in Brazil the previous round; Arsenal not allowing the plethora of attacking talent – which La U possess – the space in which they can run rings around the opposition. Instead they were drawn into a battle that got feisty and niggly as the game wore on. 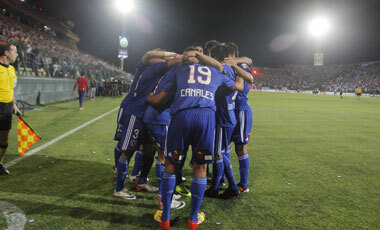 Despite a valiant effort in Argentina Universidad Católica could not replicate the performance of Universidad de Chile the previous night and overturn the 2-0 deficit they suffered to Vélez Sásfield in Santiago two weeks previously to progress to the quarter-finals of the Copa Sudamericana. A positive first half in Buenos Aires saw UC go into the break with a one goal advantage and the promise of more goals. However the second half turned into a struggle as Vélez took over proceedings and duly finished the tie with little more than 15 minutes left on the clock. It was a tentative opening to the game at the Estadio JoséAmalfitani but for the matter of inches Católica could have taken a lead through Sunday’s hero Milovan Mirosevic. Unlike the first leg UC’s large spells of patient play, Francisco Silva knocked a long ball over the top for the perfectly timed run of Francisco Pizarro who got away from Sársfield’s high line, but his low cross was just out of the reach of the sliding Mirosevic. Universidad de Chile have one and a half feet in the quarter-final stage of the Copa Sudamericana after one of the great away performances in continental football, travelling to Brazil to face Ronaldinho’s Flamengo and coming away 4-0 victors. A result they fully merited, running amok in the Estadio Olímpico Joao Havelange with a sumptuous and exhilarating performance. Ex-Real Madrid boss Vanderlei Luxemburgo lined up his side in a 4-2-2-2 system, synonymous with Brazilian football. Full-backs Júnior César and Rafael Galhardo expected to provide width to a front four including ex-Fenerbache striker Deivid and Ronaldinho. Jorge Sampaoli continued with the set-up and personnel which has served his side so well so far domestically and in the Copa Sudamericana where they have now gone over 400 minutes without conceding a goal, breaking Unión Española’s previous record. Eduardo Vargas returned to the side in the loose 4-3-3/4-1-2-1-2, supported by an intelligent and energetic midfield three and clever trequartista in Gustavo Lorenzetti. A casual observer could have easily mistaken La U for the home side from their bright start. The Chilean side made the pitch as big as possible immediately settling onto the front foot. 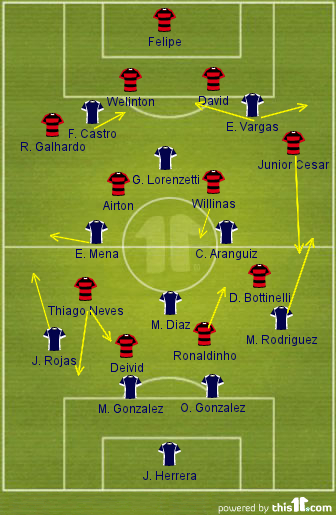 Vargas and Francisco Castro stretching the game vertically – Flamengo wary of the former’s blistering pace – and horizontally giving Lorenzetti, ably supported by Charles Aránguiz and Eugenio Mena, acres of space in the middle to work with, outnumbering Flamengo’s midfield pair, Aírton and Willians. Castro fired an early warning shot, Fla’s midfield anchoring duo too high, leaving an abundance of space in front of the defence.